What's this I see? Kids fighting over vegetables? Yes, it's true. This past Saturday at the Little Italy Mercato in San Diego, two little boys were tussling over cucumbers. Well, not just any cucumbers, Armenian cucumbers, otherwise known as "snake cucumbers" and "snake melons." "I wanted that one!" said the freckled blonde, stomping his right foot on the ground. "Well, it's mine!" said the dark-haired one, fiercely, as he handed a curly, striped cucumber as tall as he was to his mother and asked: "Can I have this?" I sighed. Ahhh! There is nothing so touching as seeing children fight over fresh farmers' market vegetables. If you've seen an Armenian cucumber, then you understand why they're so alluring. Though a variety of melon, an Armenian cucumber looks and tastes like a regular cucumber, but can grown up to three feet long! Pair them with electrifying pink watermelon radishes (a mild flavored variety of red radish) and you've got yourself one seriously spirited salad. 1. Place radishes, cucumbers, and basil in a small bowl. 2. Whisk remaining ingredients in a small bowl and pour over salad. Toss lightly to coat. Serve. Got a second? 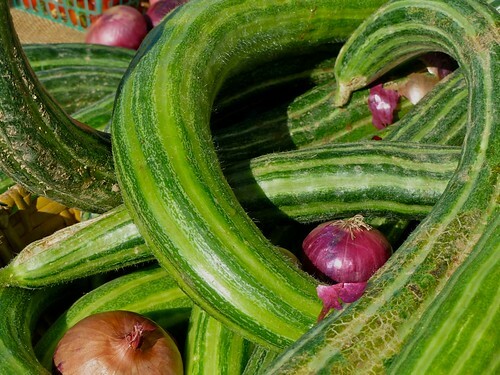 Support local farmers' markets by liking SD Weekly Markets on FB! Looks so good - crispy vegetables on a summer day (though those are coming to a wrap unfortunately :(. This salad is simply to pretty to eat. Thanks for reminding me of Mercato-- I love to take the trip down there on Saturdays but I always seem to forget. Such treasures there! I love it. First of all the idea of seeing kids fighting over vegetables. Glorious. And totally as it should be. And second of all this salad. It's so visually appealing! The colours in your sald look lovely. We call the Armenian cucumber "kheera" in India. A great thirst quencher, it is sold in summer on little carts at almost every street corner. Yummy when eaten raw, dipped in a mixture of salt and chilli powder. Seeing the watermelon radish for the first time, though. These are two ingredients I've never seen and they sure make a nice pairing. I've never had either but the salad looks so pretty with those radishes. Crazy how big those cucumbers get. My kids would be mesmerized too. Great idea, Susan! 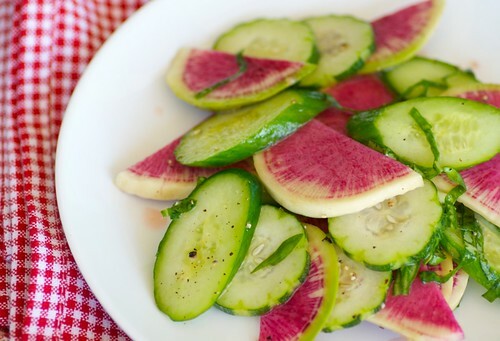 I love both watermelon radishes and armenian cukes but had never thought of pairing them. I love those watermelon radishes. I've had good intentions of growing them for a few years now, but never find the seeds. Love your salad, so pretty! I've had both of these items in my Suzie's Farm CSA share! And the only thing cuter than kids fighting over farmer's market veggies was when I took their farm tour and two little boys were very sad because the carrots weren't big enough to harvest yet. 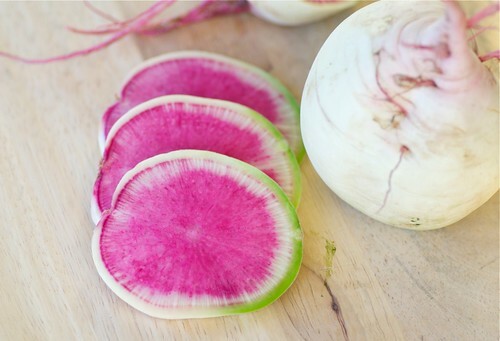 The watermelon radishes have a nice zing to them and make any dish look spectacular! Besides being good to eat, these are beautiful. If it is convenient, would you link this to My Meatless Mondays. This is a recipe, I would love to see included. This is beautiful Susan! Oh, and mouthwatering. Love that story, Susan. :-) And LOVE this salad! How stunningly beautiful! How fun to find some new fruit? Veg? And they're so pretty! I'm so jealous of your farmers' markets! Can we please introduce these kids to my kids? They'd think that these vegetables looked good, but it'd be hard to get them to eat them. They might try...but that's about it! Haha. This sounds and looks gorgeous to me though!